Heat 1 tablespoon olive oil in a sauté pan over medium heat. Sauté bell peppers and onions for 2 minutes. Add garlic and cook for 2 more minutes. Remove vegetables from pan, reserve. Season both sides of cubed steak with salt and pepper, to taste. Add remaining 1 tablespoon olive oil to pan. Sear steak on each side, 1-2 minutes per side. Add tomato sauce and beef broth. Cover the pan and cook on medium-low for 1 hour and 30 minutes until beef is tender and broth has been reduced by half. Meanwhile, for puree: Place potatoes in a pot of cold water. Bring to a boil and cook until tender, about 10 minutes, drain. Place cauliflower in a separate saucepan and cover with water. Bring water to a boil and cook until tender, about 10 minutes, drain. To a food processor, add potatoes, cauliflower, chicken broth and sour cream. Season to taste with salt and pepper. Blend until smooth. 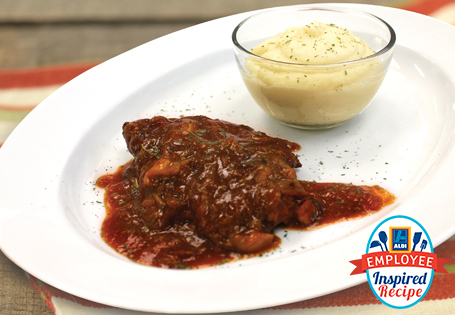 To serve, top puree with Swiss steak.